How is your Beaded Lantern quilt coming along? Are you just getting started? 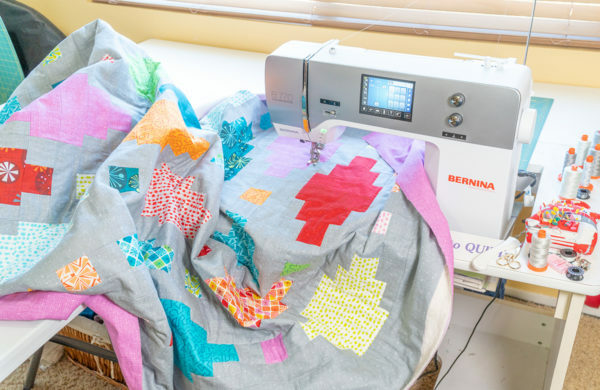 This week we will jump into machine quilting, but be sure to scroll to the end of this post for links to all of the previous tutorials and the free pattern download. Although I refer to today’s technique as “Walking Foot Quilting” you can also quilt straight lines with the BERNINA Dual Feed. 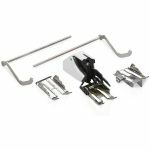 In fact, using the Dual Feed with a compatible “D” foot is my preferred method because I can use a variety of feet while quilting. When I approach quilting any quilt, I start by making a quilting plan and break it down into steps so the whole process is more achievable. I like to combine both walking foot quilting and free-motion to create interesting custom quilting. The illustrations below show my quilting plan for Beaded Lanterns. These diagrams are also included in the quilt pattern for your reference. I quilt one pass across the quilt at a time so that I’m distributing the bulk of the quilting as I go. I also keep my needle in the down position when the machine stops stitching. This gives me better control as I quilt. Notice that in my plan, I’m not stitching in every ditch. 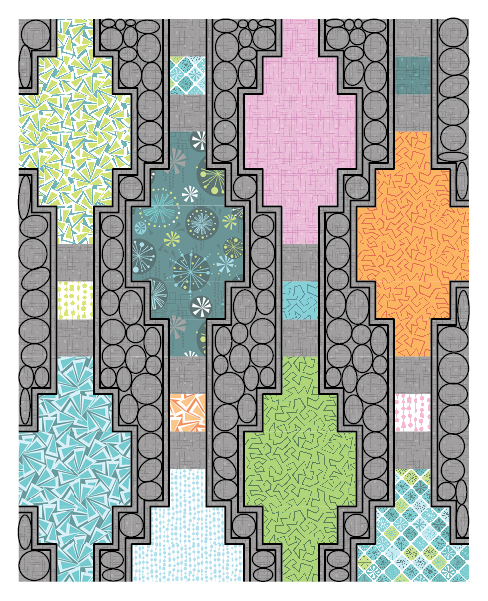 Instead, I’m treating each vertical row of blocks as one section of the quilt. I will quilt on either side of each row of blocks. This is one of the easiest way to add that “wow” factor to your quilts – quilt straight lines about 1/4″ to 1/2″ away from the ditch, using your foot as a guideline for quilting. There’s no marking involved and it further separates the blocks from the background. 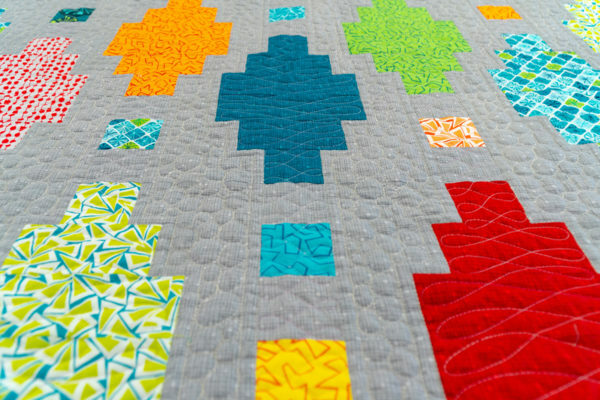 When I say quilting “something” – it really doesn’t matter which design you pick. 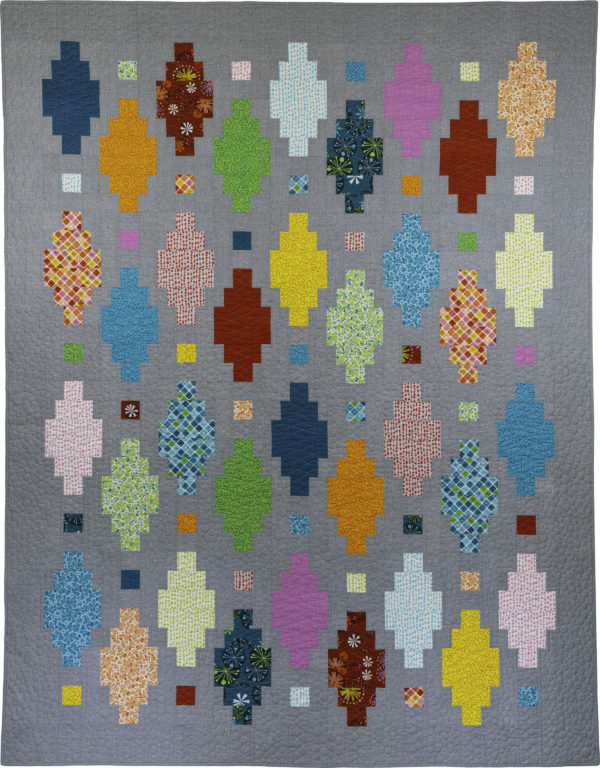 Choose one of your favorites (like pebbles above) that adds texture and just focus on one section of the quilt at a time. Pick another design for the blocks. 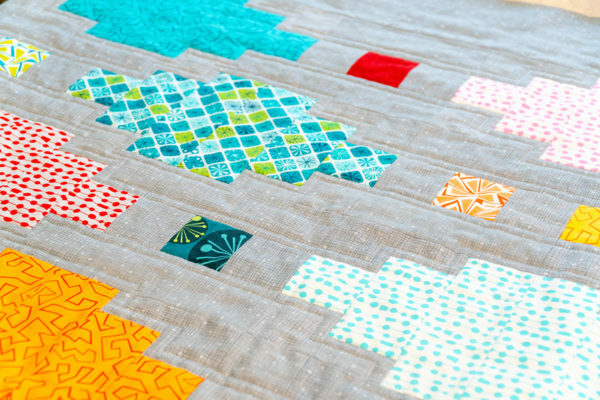 If you are using a busy fabric like I did, this design won’t show up as much, so you can experiment with different ideas, or quilt a less-dense design that’s quick to quilt. Today we will focus on steps 1 and 2. Next week we will finish up with steps 3 and 4. Because I pressed the seams open when I made the blocks in week 2, I can actually get right in the ditch. There’s no high or low side and the quilt is nice and flat with no lumps and bumps. I’m using the Open embroidery foot #20D with Dual Feed engaged for visibility with the dual feed engaged. My stitch length is set at 3.0 to help compensate for any drag or friction on the quilt and my feed dogs are engaged (just like for regular piecing.) I’ve also reduced the presser foot pressure to zero so that the foot will move smoothly over the quilt. I stitch along each straight line, then stop and slightly rotate the quilt. The hover feature is turned on for my model B770 QE so that I don’t have to stop and manual lift up the foot each time I rotate the quilt. You can also use the hands-free system/knee lift if you don’t have the hover option. To deal with the bulk of the quilt, I start quilting on the right hand side of the quilt and work my way towards the center. My B 770 QE is set into the bed of my table, and I’ve set up another table to my left, forming an L. This gives me more room for the quilt. I absolutely love having more space between the needle and the side of the machine! I scrunch and smoosh the quilt out of the way as I go and spend plenty of time re positioning the quilt as needed. My first pass across the quilt is stitching in the ditch. This secures the quilt so I can go back to any section and add more quilting later. Once I’ve quilted the ditches, it’s time to echo the ditch. I’m using the edge of my foot as a guide and it creates a channel of unquilted negative space that looks really nice. 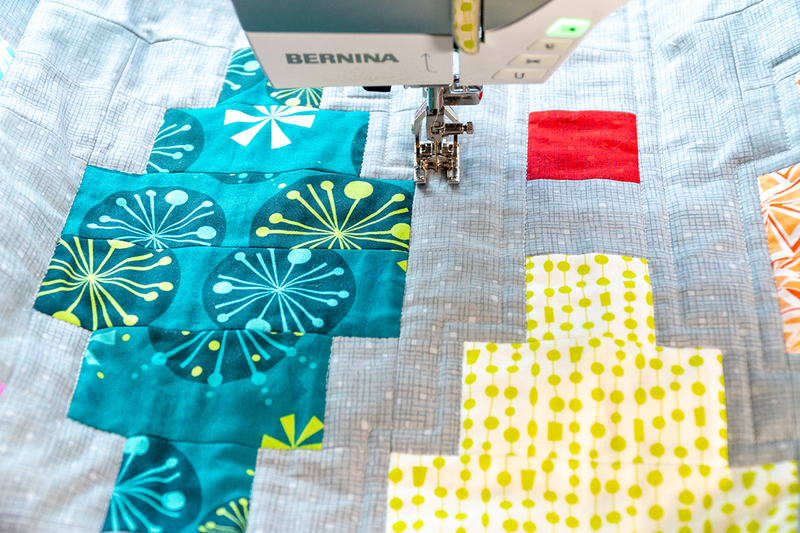 By focusing only on one step at a time, the quilting is doesn’t seem so overwhelming. Next week we will free-motion quilt the background and the blocks. All you have to worry about is one row at a time because the quilt is now anchored and secure. I was told to not quilt directly on seams because it could break the thread. That’s why I quilt beside the seams. Thoughts? Interesting I never heard that. I have sewn several wall hangings and quilts and use “stitch in the ditch” quilting and they have been fine. Good luck! There’s a link to week 1 at the bottom of the post. I have the 770qe and have never heard of the “hover” feature! Can you shed some light for me please? Check your manual. It’s an amazing feature that allows you to set how high your foot will pop up when you stop sewing. 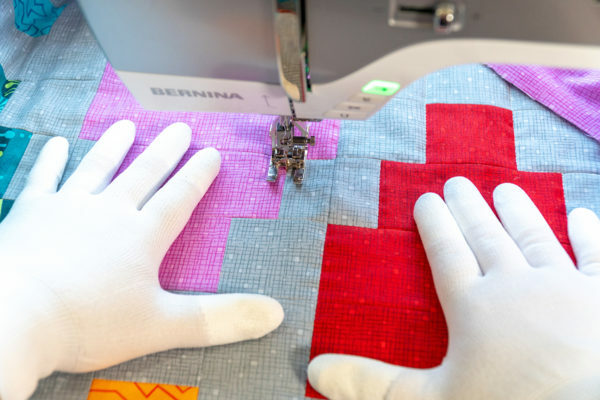 This allows you to rotate the quilt while keeping your hands on the work. Hi Christa: I’m new to your blog/website–glad I found it! I have a question about lowering your presser foot pressure (say that 3 times fast–LOL). I have reduced the pressure on other projects, but never had it at 0. I would be worried it wouldn’t have enough “grip” to move the fabric. I also have a 770 (love it)–does the dual feed foot/walking foot compensate for this? 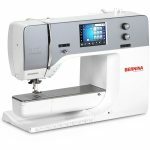 Also, what is the make and model of your sewing machine table? Would you recommend it? Thanks so much. I lower it to zero whenever I’m doing ANY “walking foot” quilting on my quilts. (I actually use the dual feed but it does the same thing). It still grips the quilt but doesn’t cause the fabric to bunch up an pucker which is FABULOUS! I don’t remember the make and model of my table. I purchased it from a dealer 20 years ago that’s no longer in business.